Blogs - Let's Give Him The Glory! At dawn, Mary Magdalene was the first to arrive at the tomb. With her were Mary, the mother of James, Joanna and other women who followed Jesus. At the tomb they encountered an angel.
. In the meantime, some of the Roman guards went and told the chief priests what had happened. They gave a large sum of money to the guards to tell people that the disciples came at night and stole His body. Of course, there were Roman guards on duty at the tomb who would have stopped anyone from stealing His body, as the consequences for the guards falling asleep was death. But the chief priests and the elders were desperate. The empty tomb was the Pharisees and chief priests and elders worst nightmare. If they guards had slept, as they were paid to say, they would have been killed. The thought that all the guards fell asleep is outrageous. This explains why the chief priests had to pay them to say they were sleeping and the disciples stole the body of Jesus. And why the chief priests told the guards they would protect them for their lies. When the women came to the disciples with the news of the empty tomb, they at first did not believe them. Peter and John went to the tomb themselves and saw that white linen that Jesus had been buried in. And the handkerchief that been around His head. They saw the tomb was empty and believed. Christ first appeared to Mary Magdalene, and then to the other women who with her at the empty tomb. He appeared to the disciples as they were huddled and frightened behind closed doors. He appeared to the two travelers on the road to Emmaus, who were followers of Christ. He appeared to a crowd of 500. In all, He appeared 12 times, and He always appeared to believers. The resurrected Christ was on the earth for 40 days before His ascension. If Jesus, our Lord and Savior had not been resurrected, there would be no Christian church. Many through the ages have tried to diminish and mock the resurrection of our Lord, and they still do to this day. But they have failed miserably. Jesus Christ is alive and sitting at the right hand of God interceding on our behalf. Who is he who condemns? It is Christ who died, and furthermore is also risen, who is even at the right hand of God, who also makes intercession for us. Who shall separate us from the love of Christ? Shall tribulation, or distress, or persecution or famine, or nakedness. Or peril, or sword? Hallelujah, Jesus is risen and is Lord and Savior for those who believe. And Jesus is coming back because He said He would and that settles it. Not one of us is promised another minute, or another day so please take your eternal destination seriously. We all have two choices and two choices only. Heaven or hell. So you might say, you do not believe in hell? But what if you are wrong? And you are. What a crucial mistake to make. Good works cannot and will not save anyone. Only Jesus saves! Jesus spoke of hell more than he spoke of heaven as He loves us and gives us every chance to accept salvation that comes only through Him. Don’t delay folks as this is serious business and gambling with your eternity in unwise and thoughtless. Today is my 67th birthday and this month is Bible Love Note’s 7th birthday, so please allow me to depart from my usual format. 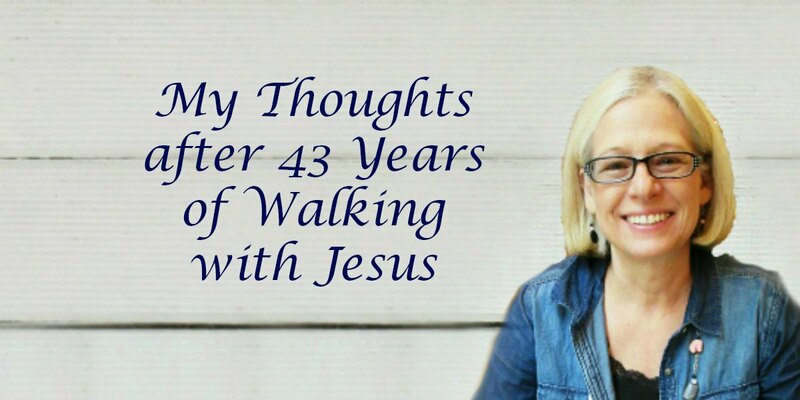 I’d like to share some of my observations after 40 years of Christian ministry, leading Bible studies, teaching Bible seminars, working with Christian women’s groups, doing overseas Christian work, editing devotions, writing a blog, doing ministry on social media, and being a wife, mother, and grandmother. 1. Christians aren’t the same, and it’s a good thing. I love the diversity of the Body of Christ: “every nation, tribe, people and language” (Revelation 7:9). It is my prayer that I will fully appreciate and enjoy how Jesus is honored in different cultures and different denominations. 2. Some Christians are growing and some are perpetual babies. Those who mature in Christ are regularly studying Scripture and letting it shape their lives (1 Thessalonians 1:4-6). Immature believers aren’t serious about growing in their faith (Hebrews 5:11-13). It is my prayer that I will always be deliberate about my walk with the Lord, always seeking to know Christ better. 3. Christians view Scripture differently. Some Christians form their beliefs based on Scripture, just like the noble Bereans (Acts 17:11). Some hold fast to half-truth errors even when Scripture refutes them (2 Timothy 4:3). There are many popular beliefs in Christian circles that are simply worldly philosophies repackaged using Christian words. They do serious damage to our walk with the Lord. The only remedy is a deeper respect for God’s Word and a commitment to check all teachings, no matter how popular, against the words of Scripture. It is my prayer that I will not be taken captive by human philosophies that contradict God’s Word (Colossians 2:8). 4. Christians don’t disagree the same. Some state their opinions kindly and humbly (Colossians 4:6). Others state their views rudely (Proverbs 15:18). It is my prayer that I will hold my tongue unless I can share my views in love (Ephesians 4:14-15). 5. Christians don’t view culture the same. Some stand on Biblical principles, no matter how unpopular (Galatians 1:10; 2 Timothy 4:2). Some change their beliefs to accommodate culture (Proverbs 29:25;Psalms 12:8; John 12:43). Culture tests Christians daily. Will we stand up for the “hard” parts of the Gospel or buckle under the pressure? The pressure comes not only from the world but also from compromised Christians. It is my prayer that I will stand firm so one day Jesus may say to me, “Well done, good and faithful servant” (Matthew 25:23). 6. Christians view Jesus differently. Some know Him and realize He spoke about sin and judgement as well as grace and love (John 15:18). Some don’t know Him and think His purpose was to make people feel good about themselves (2 Corinthians 11:14). Misunderstandings about God’s character are the source of many false teachings. It is my prayer to genuinely know Christ even if involves hardship and persecution (Philippians 3:10). 7. Christians don’t have the same committment. God’s love is wonderful and it should inspire deep committment. Some Christians motivated by His great love are focused on glorifying God no matter the cost. Some are focused on personal gain, health, wealth, and comfort. Everyone loves the benefits of Christian faith – and there are many. But genuine believers also submit to the responsibilities and difficulties of faith (John 14:21). My prayer for this coming year is that my devotions will not only encourage others to love Jesus more fully, but they will also encourage me to love Him more fully. One is not saved by going to church, doing good works, trying to be moral on their own merit, following rules and regulations or sacraments and traditions. One is not saved by belonging to a particular denomination, saying all the right words, memorizing Scripture, fasting, praying, or by saying a prayer of salvation. One is not saved by standing in a pulpit. One is not saved by being a Christian speaker or a Christian leader. One is not saved by being religious. Whether it is a prayer of salvation, or following sacraments and traditions – it is all the same. These things alone do not save us. Because they are ALL equally inadequate for salvation. But the prayer of salvation is a good place to start to communicate with our Lord. Make no mistake about this, we are all sinners! We all have deceitful and wicked hearts. We tend to drift to self interest instead of thinking about what is best for others. Christianity is distinct from other religions in the world because we are saved by grace, through faith in Jesus Christ alone, and not by our own works. We can’t work our way to heaven. We have to surrender every part of our lives to the power of Jesus Christ. Only then do we become new creatures. Only then do we know without a doubt, that we are going to our eternal home in heaven to be with God the Father, God the Son, and God the Holy Spirit. One God revealed in three distinct and eternal persons. We all have the option to receive or decline this precious gift that God has offered us. We all have the option to say “yes” to Jesus Christ or “no” to Him. As a matter of fact, it is more than an option, it is a requirement. Yes or No. People who say “no” to salvation do so at their own risk. Just take a few minutes, search the Scriptures, and see what Jesus says about hell. And see that He alone is our escape! It is really that simple. Study, pray and talk to Jesus from your heart. Salvation is nothing any of us deserve and it is nothing we can earn – it is a free gift. If you have not accepted that free gift of salvation through Jesus Christ alone, maybe today is the day. We are not promised tomorrow. This is serious business people and to delay your salvation is the biggest mistake a human being can make. Your eternal destination depends on it. Talk to Jesus one on one. He already knows everything about you. You won’t shock Him. Humble yourself this day in front of our Lord Jesus. Confess your sins to Him and repent. You can find salvation right now, today! Read more about becoming a Christian. Silence truly can be golden. I can remember like it was yesterday when my very wise mother washed out my brother Jimmy’s mouth with soap for saying the most dreaded foul four letter word that is unfortunately used in everyday language today. He was testing the waters of his ability to shock and awe our mom and she was having none of it. It is interesting to note that I never once heard him utter that word again even to this day. The only damage it did to him was to let him know his smart and vulgar mouth would simply not be tolerated. And it worked. As I watched from the down the hall, I also learned that foul language was not welcome in our home. If she had spanked him, well, I think he would have just shrugged it off, but this was different. He got the message – sometimes it is just smart to be silent. Anyway, mom never spanked us because she said we were good kids. Until that fateful day, however, when that four letter word hung in the air and sounded like he had yelled it through a megaphone. A while back I came across a list of Biblical teachings regarding Christians holding their tongues. Hmm…now that should hit us just where it hurts. We have all been guilty of the wayward tongue in some fashion or another, so we can all learn something here. The Book of James teaches us that the tongue is a wicked thing. It destroys reputations, attacks good character, it can be vulgar and damning and just downright evil. Whisperers and backbiters leave behind a road of utter destruction. Only the Holy Spirit can keep our tongues under check. When we allow Him to do so, that is. This is a list of 20 times we should remain silent. None of us hit the mark when it comes to controlling our tongues. Many of you can probably add to the list. This little Child born to the Virgin Mary confounded the world, and He still does. But one thing is for sure, so many people of this world are hurting and the most important aspect of life is to share the love of Jesus. Show others His faithfulness, His truth, His healing power and His love. It is a simple message and yet it is the most profound message you will ever hear. It is joyful, it is miraculous and it changes lives and hearts and relationships and most importantly, it determines our eternal destiny. It melts hatred and builds bridges that brings people of all backgrounds and races together in love and understanding. The love of Jesus changes things. But it must be accepted, shared, and given away to each other without any strings attached whatsoever. That kind of love will set us free! This little Child born in Bethlehem has the power to change the coldest heart, heal the worst addiction and give inner peace to the weakest and the strongest among us. The little Child born in the manger created the universe and He has the power to forgive our sins. Your sins, my sins, everyone’s sins. He is waiting for you to acknowledge Him, accept Him, follow Him, trust Him, love Him, believe in Him. For He is the Everlasting and He loves you and me. But He is also righteous and holy and one day every knee will bow to our Lord and Savior, who was born in a manger but who has the power to change the hearts of men and women who call upon His name. There were three responses to the Christ Child when He was born and there are still three responses today. Opposition, disinterest and worship. The first two responses will lead to spiritual decay and eternity without God. Only the third response will lead to eternity spent with God. Today is the perfect day to humble yourselves and repent of your sins. You know you have them. We all do. And it does not matter how bad your situation looks, for He is our great Healer and Redeemer. Trust Him. He will never fail you. This little Child born to the Virgin Mary is the Light of the world and the great I AM. This is an incredible time to be alive. As believers, we look past the craziness that has hit every aspect of our human existence, we know our Lord God Almighty is still in control and we continue to praise Him. Through it all, prophecy is unfolding, souls are being saved, Christians are encouraging each other and the church is still strong regardless of the “falling away.” (The Great Apostasy) False teachers are on the increase, while many pastors preach feel good sermons. Through the social and political messes, the insults, the anger, the confusion, the corruption, the violence, the hatred and it goes on and on, but, like so many, my thankfulness and trust still grows daily in Jesus Christ. *****I thank my Lord Jesus Christ for every day so I can humbly and respectfully praise Him and give Him all the glory for all the opportunities Christians have to share the Gospel in a fallen world. *****Thank You Jesus for the love and the compassion and the kindness and the steadfast commitment that so many have in lifting others up in Your name. *****Thank You Jesus for the encouragement You give Your followers to proclaim your Name, even when they face certain death in doing so. *****Thank You Jesus for Your Gospel that has not and cannot be stopped by the evil one. *****Thank You Jesus for the strength you give us just when we need it and in the exact way we need it. My strength comes from You! I love You, I serve You, I adore You, and I stand on Your every word. You are God’s gift to us so that our sins are forgiven as we repent of our sins to an all knowing and all powerful, omnipotent and omnipresent God. In Your name I pray all things. *****Thank You Jesus for caring about every aspect of my life no matter how big and no matter how small. Thank You that You are a God that is knowable and merciful and just. *****Thank you Jesus for my true friends and family. Thank you for bringing sincere Christians into my life who lift others up in Your blessed name. *****Thank you Lord for my blessings, as I look past personal problems and anxieties and focus on your blessings! The problems will still be there but we have the promises of God to get us through them. With God all things are possible. If you are thankful, let it be known to God and those around you. It opens the heart to better hear and understand the word of God. And if you do not know Jesus Christ, this is the perfect time, right now, to ask Him to take control of your life and humbly repent of your sins and acknowledge that He is holy and righteous, and the only way to salvation. No sin or sins is too great not to be forgiven by Jesus Christ. Please don’t delay for we are not promised another moment or another day. Do you really want to call Jesus a liar? Beware, Satan is the liar of all liars and deception is his secret weapon. He started telling lies in the Garden of Eden. He is the master of confusion and deceit. He is dangerous and he will not be stopped until Jesus Christ comes back. But before we go on let’s look at some of the Biblical names for Satan. Of course there is Satan – which means adversary, the devil – which means slanderer. Then there is the wicked one, the evil one, a roaring lion, the god of this age, Abaddon and Apollyon which mean destroyer. Then there is murderer, father of lies, the prince of this world. A dragon. Well, you get the idea. Spending eternity with Satan would certainly be pure hell. And spending time with him in this world will lead ultimately to hell…forever. This is nothing to be taken lightly. Our world makes him look harmless, laughs at him, imitates him, make jokes about him but make no mistake, he is a destroyer and he wants to devour you and me, and everybody else. Jesus is the one and only answer! Let’s look at Satan’s lie to Eve and how that lie encouraged Eve to be disobedient to God. He knows so well how to tempt but God always gives us a way of escape if we are obedient. Eve gave into temptation, even though she knew eating from that particular tree was forbidden by God. Satan’s lies are the same today but just repackaged for our culture and times. We can all look at our own lives and see where Satan has done considerable damage. Pride, self-absorption, self- hatred, self-promotion, self-exaltation and the “self” list goes on and on. When we get too wrapped up in self, instead of focusing on our blessings, we will be be disobedient to God. We desperately need discernment from the Holy Spirit, strength in Jesus Christ and the truth of God’s word, the Holy Bible, on a daily basis. Otherwise we are more susceptible to Satan’s lies about ourselves and others. Satan always wants us to leave God out of our plans, out of our daily lives, and out of our relationships with each other. He constantly works to create doubts and confusion through lies and temptations. If you do not have a relationship with our Lord God Almighty, pray this very moment to Him and talk to Him about your sins and repent of them now. He is waiting for you to humble yourself and turn your life over to Him. He has given us His Son Jesus Christ to redeem us and to give us a new birth. A new beginning, a new life, and the promise of eternal life. Nothing you have done is so bad that it is out of His reach of forgiveness. Nothing! And if you think you are a good person who does not need a Savior, please, think again as you are wrong. Jesus paid it all on the cross and all you have to do is accept that in faith and know that He will never leave you. Don’t take a chance on leaving this earth without salvation, found only in Jesus Christ. Tommy Has Seen the Face of Jesus! Tommy was one of my dearest friends and he has now seen the face of Jesus. Tommy went to be with the Lord on February 25th, 2017. I miss him so much. Every single day. We all know what it is like to lose someone we love and hold dear. We all know the tears and the broken heart that goes on and on and seems like it will never heal. But, of course, it will and it does. By the grace of God, we continue on, knowing that the day will come when we see them again in the presence of Jesus Christ. There is no doubt in my mind where Tommy is and I stand back in awe knowing that he has seen the face of Jesus Christ and he has looked into His eyes and that Tommy is alive like never before. The pain is gone and his incredible struggle is over. He fought cancer with faith and courage, like so many have done and will do. He did it with grace and humor and, yes, with a great deal of heartache. But mostly he did it with Jesus! I watched his wife stand by him and care give day after day. I saw her weep and then find her courage again and again and again. When you go through the daily struggle of an illness with someone, you change. You feel the agony and you praise the Lord for all the good, and you take a stand with another human being and make it clear that you are on their side. You are with them day in and day out. That is when either the best or the worst comes out in you. Oh, there were days when I look back and think only if I had been a little kinder or took more time to talk with him a little longer on a particular day. One day I was taking him to treatment and we talked about everything all the time, but he was very intent on telling me that he just knew that Jesus was going to heal him. He just knew it. He said it with such passion and I knew he believed it. I wish I had said, Tommy, Jesus honors you for believing that no matter what and He can heal you at any point and time. But I did not say anything. I was so tired and so sad that day and I knew he was slipping away from us all day by day. If only I had that moment back again. But thanks be to God, I have really learned recently that we must give all of our “if only’s” to Jesus and not take them back again. It is not spiritually healthy to carry them and hang on to them and relive them and nourish them back to life. Let them go. Tommy was unique to say the least. He was a former Police Sgt. and he was tough. He had a right to be. He had seen a few things he wished he hadn’t seen, and carried too much pain deep in his heart. But this is the side of Tommy that I knew the most. He loved Jesus! And he really did fulfill the Great Commission. He talked about Jesus to everyone and anyone who would listen. He encouraged so many people, quietly, and without fanfare, he simply spoke gently to others about where to turn – Jesus alone. He has now experienced complete and total healing. We miss you Tommy, but how glorious it is that you are with Jesus! !